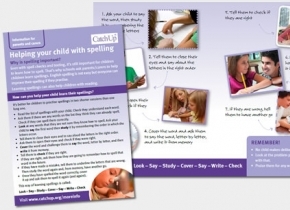 Catch Up® has produced a set of three Catch Up® Literacy leaflets that give useful tips for parents and carers about supporting their children with reading and spelling. All of the Catch Up® Literacy leaflets for parents and carers are available, and may be reproduced, free of charge. Download them below. The leaflets are designed to be A5, 4 pages - to reproduce, print on an A4 sheet of paper, double-sided (on your printer settings, choose to 'flip it' on the short side) and then fold along the middle to make an A5 leaflet. Print in colour for best results.